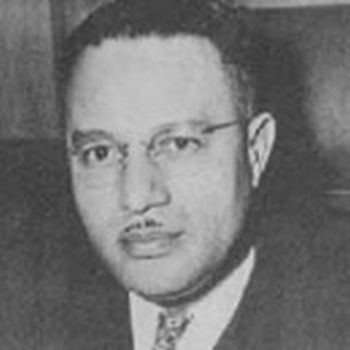 Myles Anderson Paige, the first African American to be appointed a New York City Criminal Court Judge, was born on July 18, 1898 in Montgomery, Alabama. Paige was a star football player at Howard University, graduating from the Washington D.C. institution with a Bachelor of Arts degree in 1921. In 1921 Paige entered the Columbia University Law School and received his LLB degree in 1924. In 1926 he was a founding member of Alpha Phi Alpha Fraternity’s Alpha Gamma Lambda graduate chapter as well as its first chapter president from 1927 to 1930. Paige later served as 19th General (national) President of Alpha Phi Alpha Fraternity from 1957 to 1960. Also in 1940 Paige received an honorary doctor of law degree from Howard University, rounding out his education. Myles Paige began passed the bar in 1925 and went into private practice. In 1929 he became Assistant Attorney General of the state of New York, a post he held for two years. On September 1, 1936, New York Mayor Fiorello LaGuardia appointed Paige to the Magistrates Court. In 1939 when a vacancy occurred in the Court of Special Sessions, Mayor LaGuardia appointed Paige to that court making him the first African American judge criminal court judge in New York State. He remained on the Court of Special Sessions until 1956. Two years later New York Mayor Robert F. Wagner appointed him to the Domestic Relations Court (now called Family Court) where he served until his retirement in 1966. Paige reentered the U.S. military soon after the bombing of Pearl Harbor and was immediately named a major in the New York State National Guard. On February 12th, 1942 he was appointed Commanding Officer of Third Separate Battalion. As such he was the highest ranking African American in the New York National Guard during World War II. At the end of his military service in 1945 Paige had achieved the rank of colonel. In addition to a distinguished military career and a groundbreaking stretch in the New York judicial system, Paige was also very active in various social and political clubs. In 1951 he became the first person to take out a life membership at the Brooklyn branch of the NAACP. He also served for a time as the president of the Harlem Lawyers’ Association. Paige was a member of many Catholic organizations including the Knights of Columbus, Holy Name Society and the Catholic Lawyers Guild. Survived by his wife Dorothy and his two daughters, Myles Anderson Paige died on March 30th, 1983 in Los Angeles, California. “M. A. Paige, First Black to Be a City Magistrate,” The New York Times, April 1, 1983; Charles H. Wesley, The History of Alpha Phi Alpha : A Development in College Life (Chicago: The Foundation Publishers, 1979), Martha Biondi, To Stand and Fight: The Struggle for Civil Rights in Postwar New York City (Cambridge: Harvard University Press, 2003).